Once a year our company comptroller releases display models, for sale. That time of the year has arrived for 2 for our New 2010 RT Quad-slide models and one of our New 2010 SKP quad-slide models. We display these models on the Colorado River in Arizona as a whole bunch of potential buyer, "snow-birds", tour the River during the Fall, Winter and Spring months as they are dodging the cold, back home. Full timers or "snow-birds" are active shoppers for quality 4 seasons insulated fifthwheels, built to meet the rigors of full timing. 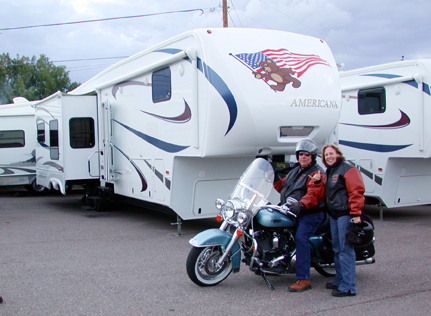 They appreciate having the new Americana models available to see during their seasonal tour. Even with the additional display model discount the sale price is not cheap, as these models are extremely well equipped, including American made Goodyear "G" rated tires, hydraulic disk brakes, smooth towing /leveling air ride suspension and upgraded furniture and air-mattress sleep systems. These particular Americanas are a best value and any other fifthwheel built to our standards would cost at least $10K to $15K more than our sale price. Checkout would feature over night stays at the AVI KOA campground located on the Colorado River near Laughlin, Nevada/Bullhead City, AZ. Many of our out of area shoppers fly into Las Vegas, using low promotional fares, rent a car and drive down to our display (click here to download a brief PDF info sheet about Americana RV). Also below are snapshots of the Bullhead City Sales location (the model next to the street in the foreground is the SKP39/40 Quad-slide), and some of our RT Model shoppers on their Harley. Please contact Russ Anderson at Russ@AmericanaRV.com for more information. Let us know which floor plan most interests you and we will e-mail you the current customer order sheet, detailing the optional equipment that has been added along with the additional discounted price.